Spring is the most active job cycle of the year when you stand the best chance to find and land a new opportunity or that all-important first internship, according to recruiters and job boards. But competition also is greater this time of year, so you must find ways to stand out against the hordes of others who are entering the job market and/or graduating soon. Informational interviews can help jump start your search, increase your network and provide essential interview experience. 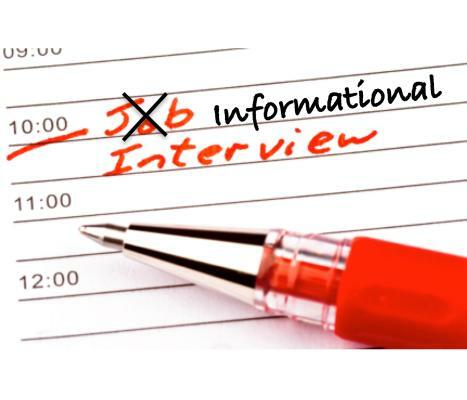 But planning for a successful informational interview is important so never go in cold. Starting with the request for the informational interview to your research of the person generously talking with you to the critical follow up, you must prepare just like you’re facing an actual job interview. Often, informational interviews lead to future jobs and they almost always result in creating an advocate that can point you towards current opportunities. If you haven’t already done an informational interview, this short video does a great job of describing the process. Provide a hook. Demonstrate why you really want to meet with this person. Maybe you admire their career path or see some similarities between their education and yours? Perhaps you have a shared connection? Whatever it is, be sure to state it in the email. Be extremely considerate. Remember, this person is putting their job on hold for you, so acknowledge how busy they must be and say that even 15-20 minutes would be appreciated. Don’t make it seem like you’re looking for a job. Make it clear you just want to talk to them about their perspective on their job and experience in the industry. Once you land the interview, organize your thoughts and approach to the one-on-one session. TheMuse.com offers three basic steps to remember as you go into the interview. Before embarking on your first informational interview, please read “Forget ‘Can I Pick Your Brain?’ Ask for Advice” in The New York Times. This article provides a treasure trove of sound advice. Prompt follow up is absolutely essential. And not just a generic thank-you note. (Email is okay, but a handwritten note makes you memorable). Cite a particular piece of advice that you found most helpful. This shows you were listening. As your search progresses, drop your contacts periodic updates—especially if they provided contacts who you met. And let them know when you landed a job. Don’t let those you found helpful in your search learn about your new job through LinkedIn or social media.